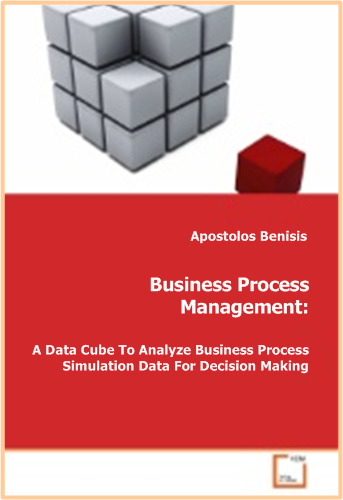 How can data cubes (multidimensional data models) be used in the context of Business Process Management (BPM) to support management efforts in understanding, planning and improving business processes? Traditional approaches define a customized multidimensional data model for analyzing operational data. The proposed approach is to define a standardized multidimensional data model for analyzing data that can be applied to any business process model. This approach is novel and innovative, not only because of the mapping of business process data to a data cube, but also because, once the mapping has been completed, and facts have been generated (e.g. via simulation), non-technical business analysts are able to have a completely new understanding of the dynamic behavior within organizations by using an extensive range of inquiries that are possible using standard data cube analysis interfaces. Business process management, simulation and the use of a tested methodology have complementary roles in providing businesses with useful information so that managers can make better decisions. processes. It is a top down, cross-functional, process centric management approach, which deals with the design, implementation, control and improvement of the end-end process of an organization. Business process modeling, as a part of Business Process Management, provides a visualization and static analysis component that describes the context in which a set of activities occur. Simulation provides a dynamic behavior component that is able to test assumptions about all conditions that effect process performance. The three perspectives (BPM, business process models and simulation) allow the extremely complex interactions and inter-dependencies within organizations to be better understood by managers, so that they can better direct their organizations. All three views are associated with traditional analyses methods that are at best, only partially integrated. Due to lack of integration, and the current cumbersome, highly technical, analysis techniques available, many critical questions cannot be easily answered or they cannot be answered at all. process modeling, simulation and data cube analysis techniques, by combining, transforming and integrating all relevant data into a data cube structure that can be easily created and queried. In the context of business process modeling, a multidimensional model for analyzing the data generated by business process model simulations is developed. A process model, along with the simulation meta model, is used to define the dimensions and the facts for a multidimensional model. The multidimensional model developed is a generic one and is therefore not constrained to a specific kind of a business process model. When using the this approach, non-technical users are able to analyze a specific business process model and answer critical questions about their organization. The business process model is used to fill the dimensions with data, and data from simulations of the model are used to fill the facts. The business process cube makes it possible to answer a wide range of mission critical questions regarding the performance of the organization. Questions that can now be answered range from simple ones like “What is the time required to perform Activities per Process?”, or to more complex questions which could not be easily answered before, such as “What is the average throughput time and costs for processing a specific piece of Information for a specific type of customer for each product type between a specific Input and a specific Output?”. I am fascinated by technology and passionate about innovation. I follow a path that combines technology, people and business skills and along the way, I shape organizational culture. In practical terms, I lead agile, multidisciplinary, cross-functional and self-organized teams that take ownership and responsibility of the end to end development process. We put the customer in the center and utilize technology to innovate and build great products that users love and create value for all the stakeholders. A blog about people, technology and business.